Discovery Bay FC overcame a potential banana skin in emphatic fashion at the weekend taking down a struggling Forward FC 4-1 at Wu Shan. Forward didn’t help themselves by only having nine men available but put in an organized display to keep the score line to what it was. DB started well and were the more dangerous side in the early exchanges making the breakthrough from a fantastic strike from the edge of the box. Forward came into the game more and had a couple of sights at goal but couldn’t covert. However, ten minutes into the second half Forward did level the scoring when Victor Chiwi Chiwas netted and with twenty minutes to go the game was in the balance. However, the two extra men advantage told on the big pitch and when Forward had two defensive lapses DB capitalised to take the game away from Forward. A late “fluke” strike from a mis-hit cross making the final score 4-1. DB scorers: Jordan Brown, Kafi Harun, Pius Kisambale and Josh Brown. Wanchai Spartans put a dent into the title challenge of J-Leaguers as they saw off their opponents 2-0. Having seen his team perform better when he is not around, joint manager Steph Kelly was happy he was part of a win and stated this was his teams “best performance of the season” especially given they had seven “starters” out injured. A lovely first goal from Simon Lui put them ahead and on their way with a second strike in the second half from Damo Pilat sealing the points against a 20 strong Japanese team. Club Tropicana made it 2 wins in a row as they comfortably saw off Bants 4-1 at Aberdeen Sport Ground. However, it may have been different 20 seconds into the game when Tropics centre back was dispossessed inside the centre circle with the Bants striker running onto a 1 v 1 but a lack of composure saw him fumble a shot from 20 yards as the keeper rushed him. Tropics were very dangerous from the set piece with numerous balls into the box finding unmarked Tropics players but chances were not converted. Tropics did take the lead twenty minutes into the game from a corner when Paul “Pony” Ryding got on the end of the cross. Ten minutes later it was 2-0 when Aidan Walker collected the ball inside the Bants half and ran through into the box to put it away. John Rammage calmly side footed the third a minute into the second half before Bants pulled one back via JP Lam. In the final seconds Nico Staffieri robbed the ball from the Bants left back and ran 30 yards into the box before slotting it into the goal. USRC got back on track following their previous league defeat by taking Corinthians down 3-0 via goals from Kieran McBride, Ian Casey and Roy Man. However, Cors could have been 1 nil up inside 5 mins when Mike Fry had a golden chance and that miss came back to bite them as they were outplayed for the rest of the half with USRC going in 2-0 at half time. After a talking to at half time Corinthians came out strong in the second half and had they not been facing a keeper in inspired form they deficit would have been reduced, however, the USRC keeper pulled of four or five “worldliest” and when USRC got they’re third the game was over as a contest. 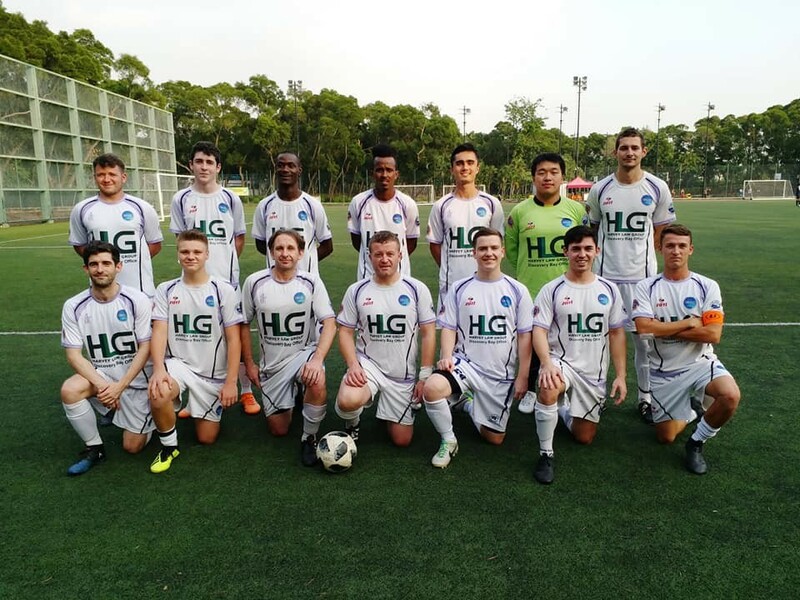 It should have been a battle of the bottom two when Scottish Stags took on HK Krauts but in the end it was a stroll in the Saturday sun as Krauts rolled over to get their tummies tickle in a 7-0 thumping. Goals from Myles Winter (2), Lorenzo Budini Gattai (2), Aaron Tennant, James O'Shea and Jordan Touati means Krauts now have only 1 point from a possible 18 so they’ll need to start picking up points soon otherwise it’ll be Auf Wiedersehen to Division 1. 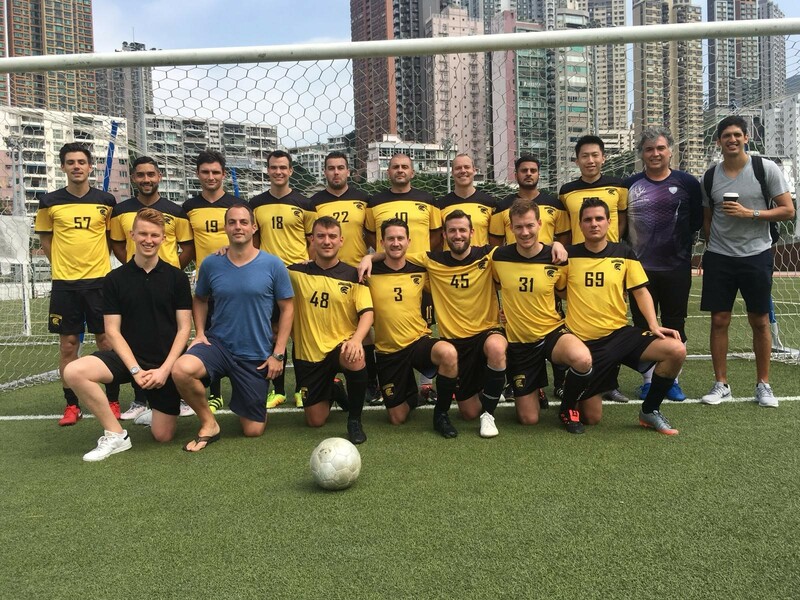 If Week 6 was a ‘feast of goals’ then Week 7 provided a 2 day free-flow brunch of action as the most exciting league in the world (well in HK amateur Division 2 systems), continued to serve up drama, controversy and a quite frankly ridiculous total of 60 goals scored across 8 games. San Pells and Shooters kicked things off in a contest that was closer than most expected. The Japanese side were well organized and difficult to break down in a game of ebbs and flows. A Yasushi Kakizaki strike and an OG were ultimately not enough as goals from Peter Harrod (2) and Richard Bindrup saw San Pells make it 6 wins from 7 and move them to the top of the pile whilst Shooters remain 14th. 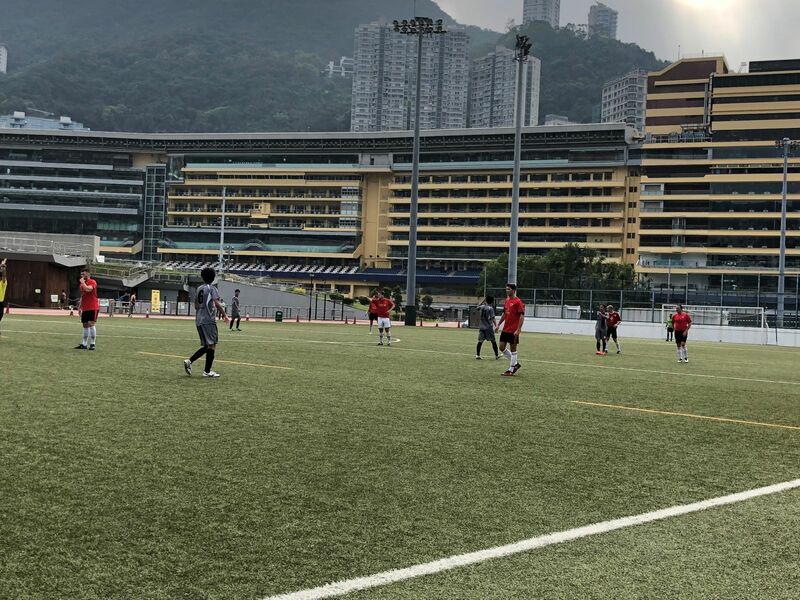 In the other early kick off on Saturday, Shui Wei should be given credit for getting a team out and fulfilling their fixture despite a major shortage of bodies. Despite this, Wolves were in an unsympathetic mood as they ripped their opponents apart, eventually winning 8-3 although only reporting 7 goals?! Sok Wan showed again that he has style bagging a brace with other strikes coming through Victor Johansson, Ronnie (hopefully not that one), Hon Ng, Gav Cee and Marcus Von Sydow. Eric Keck (2) and Ruud van Gelderen made the score-line a little more respectable as Wolves leapfrog their opponents into 5th. Old Speckled Men handed a debut to Chris Ingam in their fixture with Dragon Valley and he doesn’t look a bad signing as he was in inspired form; scoring 5 in a 6-2 victory. DV manager was full of praise stating that they faced ‘pretty much the most clinical player I’ve seen in Hong Kong’ as they were blitzed early on and facing an uphill battle after being down 3-0 at HT. Justin Davis pulled one back for the Dragons and Dave Reid scored to make it 4-2 at the time but a couple of late breakaways sealed the deal for Old Speckled Men. Ally Kelly got the other goal for the victors. Vikings and Young Guns failed to get the memo that ‘normal’ results are not allowed as they played out a 1-1 draw. Kristian Skjorshammer gave the Danes the lead and it looked like being their day until a red card early in the 2nd half changed the complexion. Young Guns fought back and levelled through Dennis Chan and had a couple of chances to win it at the end but both managers agreed a point was probably fair in a classic game of two halves. Mes remain unbeaten having dropped just 2 points so far this season as they destroyed BOCs 12-1. Will Harvey got a hat-trick with Ollie Davies, Rob Barrett and Liam Kelly getting a couple each. Massie Kallon, James Green and an OG completed the rout. Mohamed Lemistef got the consolation for BOC who stated ‘Mes, you guys were too good and need to go back to Div 1’. (At this rate they may get their wish). Spare a thought for the BOCs keeper as they have now conceded a shuddering 32 goals in their opening 6 games. 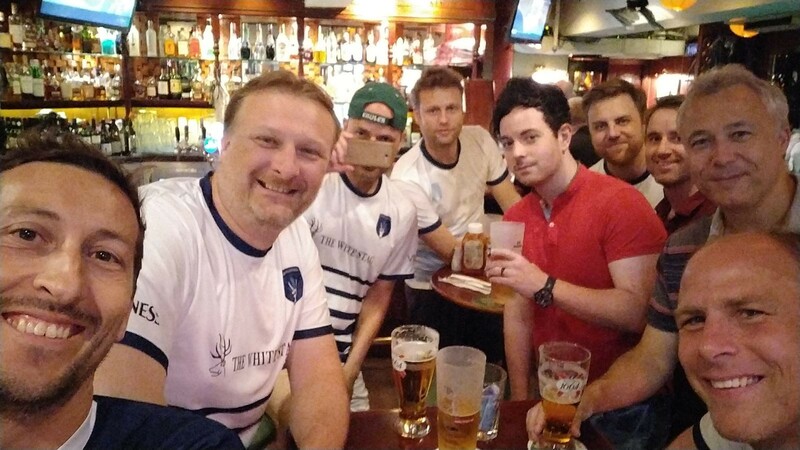 That result meant that MBFC could move off the foot of the table if they could avoid defeat by fewer than 4 goals in their fixture with Samurai Blue. Alas that was too much to ask though as they went down 5-0 in a bad tempered affair which both sides agreed was not well officiated (MBFC querying if the ref was bought from Taobao). SB took the lead through a debatable penalty and never looked back in a game where their opponents went down to 10 men following a red card for spitting. Chris Cocoran (2), Kevin Frimpong (2) and Ahmed Jemli were on target to give Samurai their 2nd win of the season. On Monday night KCC Cavs looked to maintain the status quo and their perfect start to the season but there was a Revolution in town as their 100% record was blown to pieces in a 5-0 humbling. Revo came with a plan and left with the points to give manager Snelly a very happy birthday (21 again?) After going close twice early on, the deadlock was broken when Dave Brown controlled the ball on the edge of the box, flicked it up and volleyed it on the turn with the ball swerving beautifully in to the stanchion (a feat he will likely never achieve again judging by the confusion around how to celebrate). Tim Rechter made in 2-0 heading home a perfect free kick delivery before an even bigger (literally) story emerged. Revo legend Richard Hudson was brought on up front with 5 minutes of the half remaining and repaid the faith, using his 9ft7 frame to head home his first goal since November 2001. Cavs came out strong 2nd half and missed a couple of decent opportunities before Matt Creighton smashed home 2 more for Revo to put them back in the mix and blow the league wide open. The final game continued the trend of troubling the scorers with another 11 goals added to the tally. Unfortunately for Legal Head (and the sake of competition), KCC Royals got 10 of them in a Halloween Horror Show at King’s Park. Jamie Kelly did register for a depleted Head side who simply stated there was no excuse for how badly they played despite a good Royals performance. Luca Merlone and Ben Walker were left to fight over the match ball after getting 3 each with further goals added by Dan Jacques (2), Sam Trayford and Dave Lau. Whilst admitting the final result was a little flattering, credit must be given to the clinical nature of the KCC side in ensuring they stay in the hunt for a top half place.